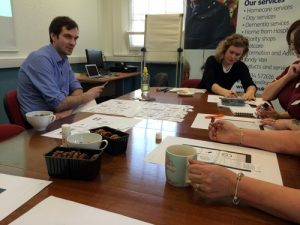 People often ask us about how we’re funded and it is a bit different from most of the other accelerator programmes out there so we thought we’d try and explain. This is how it works. 50% of our funding comes from the Cabinet Office’s Social Incubator Fund. Over four years they’ve granted us £1 million. That money is matched by £1 million in grants and loans from Nesta and a grant from Nominet Trust. The mathematicians amongst you will guess that means we have a budget of £500,000 per year. 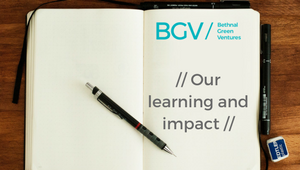 Of that we invest £300,000 directly into ventures (20 x £15,000) and £200,000 goes on our running costs including our salaries, legal costs, getting the word out about BGV and all the other money you need to run an accelerator programme. Our running costs are actually slightly more than £200,000 per year so we also do occasional pieces of consultancy work or ‘special projects’ as we call them. That includes things like Good Incubation or work we do with the Building Change Trust in Northern Ireland as well as advising a few organisations in other parts of the world that are setting up new social venture accelerators. We’re very lucky to have great people working at all the organisations that fund us. 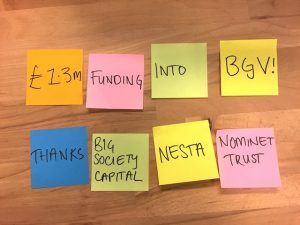 Big Lottery Fund (who manage the grant on behalf of the Cabinet Office), Nesta and Nominet Trust have all added way more value than just the money they put into the programme. We report to them all formally on a quarterly basis but speak to them most weeks. 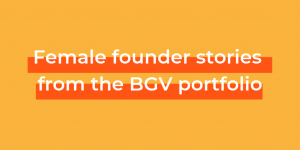 When there are returns from our investments (we get 6% of the shares in ventures when we invest), the majority of them will be reinvested into the next generation of ventures and the rest will go to Nesta and a small percentage to the BGV staff team. The aim in the end is to try and make BGV an ‘evergreen’ fund.